Inadequate exhibition space and scattered conservation facilities prompted the redevelopment of buildings on the British Museum site in Bloomsbury, London, for display, conservation and storage purposes. Four storeys, approximately 60 per cent of the new 18000 m2 facility, were constructed underground to minimise impact, and four three-storey steel frame pavilions will be located above ground level. The basement was formed with 900/600 mm hard/firm secant pile walls installed up to a 15 m excavated depth over the full area of the site. 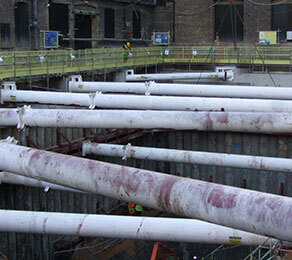 Three levels of temporary propping were required for the substructure. CCL was called in to advise on the application and maintenance of the loads required to be applied to the props. The company supplied 87 no. flat jacks, and carried out their installation, jacking and grouting.